Ocean Grande Place is an exclusive luxury community located just across from the Atlantic Ocean in Highland Beach, Florida. These 17 Mediterranean style estates are locked away behind an entrance gate, providing homeowners the peace of security while living in paradise. Beyond the gated entrance lies the sandy, Florida beaches with private access for Ocean Grande Place residents to lounge by the water and soak in the sun. 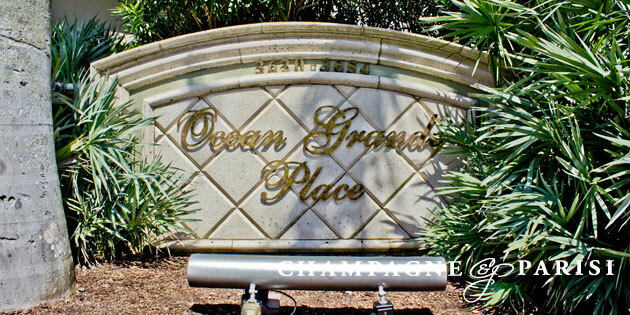 Ocean Grande Place estates are the ultimate in Oceanside living. This community is built on a large space of lavish greenery and tropical landscaping, and is highly coveted real estate to own. Residents in Ocean Grande Place Highland Beach live in homes ranging in 2,600 square feet to just over 4,000 square feet of luxurious features. Each property boasts attributes such as glamorous swimming pools, updated granite countertops, gourmet kitchens, oversized master suites, large open floor plans, marble floors, home gyms, grand entertainment areas, among many others. Residents of Ocean Grande Place will always have plenty of activities to enjoy. Ocean Grande Place offers a community pool for residents and because of its prime location, residents can enjoy various water sports as well. These water sports include swimming, diving, boating, kayaking, tubing, wake-boarding, surfing, fishing, paddle-boarding, to name a few. Outside of the community, Ocean Grande Place is located between two of South Florida’s major cities. Residents can strut down the famed Downtown Delray Beach Atlantic Ave, enjoy Boca’s Mizner Park, and enjoy many other boutique style shops and fine dining establishments in between.